When it comes to outdoor living and commercial entertaining in Vancouver, WA there is little more appealing than a cleverly placed outdoor water feature. Waterfalls and features are impressive no matter where they are installed, but a strategically placed custom water design can elevate an outdoor entertainment area significantly. Regardless of the size of your outdoor living space or commercial entertainment area, with help from seasoned professionals, you can have a delightful and relaxing yard that boasts an expertly crafted water fountain or waterfall. Furthermore, an expertly designed water feature will not only substantially increase curb appeal, it will also increase the overall value of the property too. Tranquility, peace, and relaxation are a few perks you will enjoy when you choose waterscape design for your property. With high-quality outdoor water features, the options are truly endless. If you have a vision, a professional on staff can work with you to create the serene outdoor environment you’ve been dreaming of. Additionally, a custom crafted water features can be created to suit your existing landscape with your ideas as the inspiration. Below is a quick overview of Boulder Fall’s most popular water feature options. Don’t see what you have in mind? No problem. Customer satisfaction is the top priority, so if you can envision it, we want to help make it happen. For more information or to schedule a free no obligation consultation, call Boulder Falls today! 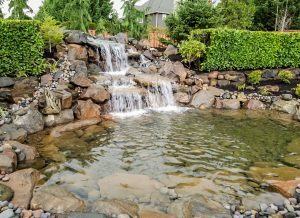 Also serving the waterfall construction and waterscape design needs of those in the greater Vancouver WA and surrounding areas.